We believe in educating our clients on proper tree pruning and proper lawn maintenance. We strive to provide the very best lawn and tree service. 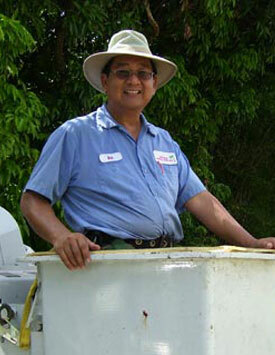 Bob Chung, founder of Bob Mar Lawn & Tree Service, is involved in every aspect of the job from start to finish. When you call for an estimate, it is Bob who comes out to give you an estimate. He works with the crew to complete the jobs. In 1982, after being layed off as a Chinese cook (we were in a recession back then, too) Bob Chung started to mow his neighbor’s lawn. Quickly, one neighbor became five neighbor’s lawns. As the customer base began to grow, Bob researched and learned all that he could about proper lawn maintenance, plant fertilization and plant care. After achieving 45 lawn accounts, he decided that he needed a helper, and another and another. Then Hurricane Andrew struck. Bob stuck it out and slowly rebuilt. In 2002, after numerous requests from clients to do tree trimming, Bob bought his first tree lift, started trimming palm trees. Loved it. Went to school. And the rest is history. Bob Mar Lawn & Tree Service is now Miami’s number one lawn service and landscaping company. You can find our list of services offered here. Fully insured. We carry $1M/$2M general liability including operations complete. CALL US... we'd like to get to MOW you!